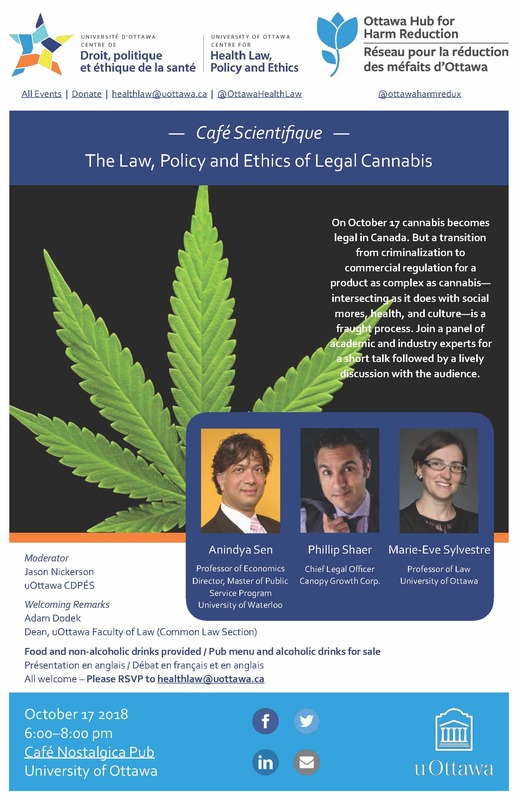 The University of Ottawa’s Centre for Health Law, Policy and Ethics and the Ottawa Hub for Harm Reduction will be hosting a Café Scientifique on The Law, Policy and Ethics of Legal Cannabis on Wednesday, October 17 from 6:00-8:00 p.m. at the Café Nostalgica Pub at the University of Ottawa. A panel of academic and industry experts will give a short talk of cannabis’ complex intersection with our social mores, health and culture, and then field questions from the audience. It promises to be a lively discussion! The Faculty of Law has been at the forefront of this issue since it announced its Cannabis Law courses in April 2018. Professor Diane Labelle (Health Canada Legal Services) has been teaching “La règlementation du cannabis” to 20 students since the beginning of the Fall 2018 session, and 22 students are signed up for the “Cannabis Law” Winter 2019 seminar, which will be taught by Joël Dubois and Megan Wallace from Perley-Robertson, Hill & McDougall LLP. Registration for both courses was quickly met, and there are currently 65 students on the waiting list for the winter course! Both courses have been extremely popular as our students are keen to grasp the legal implications of cannabis legalization in Canada.